Re-open Add-in Manager, check the new add-in for Startup and Save. If an add-in is not visible in Add-in Manager check whether it is blocked as downloaded from the Internet. AfterClose v1.0.2 - activates the next tab (instead of the last selected document) after closing the active one. AutoOpener v1.0.9 - automatically opens corresponding files. AvalonStyleEditor v1.0.2 - extends style editors in Tabs Studio with syntax highlighting, a color picker and additional commands. CloseClick v1.0.1 - close a tab by double-click. CloseRight v1.0.0 - adds a context menu command to close all tabs to the right of the selected tab. Disambiguator v1.0.6 - detects when two or more tabs have the same title and adds Visual Studio folder or project to titles for these tabs. ITransform v1.0.3 - creates custom tab titles for prefix grouped files. Localizer v1.0.0 - tab context menu translation for German and Spanish localized Visual Studio editions. Marker v1.2.0 - highlights tabs with Ctrl+Click. MRU v1.0.0 - sorts the tabs in the most recently used way. MvcGroup v1.0.2 - groups ASP.NET MVC controller and view tabs near each other (a controller is placed before views). Also adds IsController, IsView and GroupName properties for coloring. Navigator v1.1.9 - provides additional Visual Studio commands to switch tabs using keyboard. NewGroup v1.0.9 - adds New horizontal/vertical tab group commands to the Tabs Studio context menu. OpenAll v1.0.1 - adds a new context menu command to open all available corresponding files at once. OpenDesigner v1.0.1 - adds a context menu command to open a corresponding [Design] view. OpenNext v1.0.2 - changes default placement for a new tab from the right end to the right of the active tab. OrderKeeper v1.0.0 - maintains order when a tab is closed and reopened. OrderEx v1.0.2 - reorders extensions in a tab. By default places .h before .cpp. PriorityGroup v1.0.5 - places important tabs to the beginning. RestoreToolbar v1.0.0 - adds the Restore Toolbar command to the tab context menu. Saver v1.1.1 - restores tabs order when opening a solution to the last state. Shaper v1.0.4 - adds the customizable TabShape control specialized for trapezoid tabs. See Visual Studio 2008 style and Chrome style as examples that use this add-in. SingleRow v1.0.8 - limits the maximum number of tab rows and shows remaining tabs in a drop-down list. Sorter v1.1.3 - automatically sorts tabs by project, name, highlight index etc. SQLComment v1.0.7 - adds an SQL query description to the SSMS tab name. SuperCommands v1.0.0 - adds Close super group and Close all but this super group tab context menu commands. SuperName v1.0.1 - adds the corresponding project name to the first tab in each super group. Sync v1.1.0 - adds a new command to the Tabs Studio context menu to locate a document in the Solution Explorer window. TrackEd v1.0.2 - tracks edits and shows yellow or green bar in the tab title. 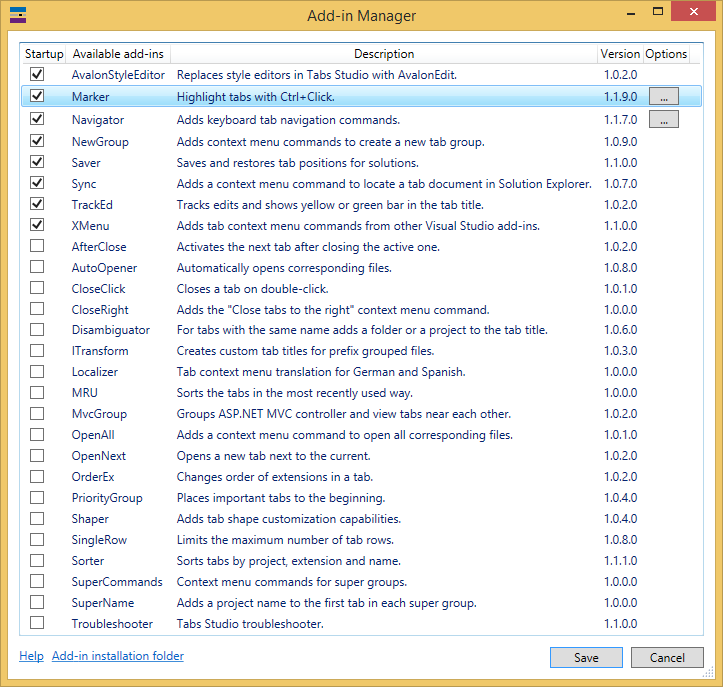 XMenu v1.1.1 - adds tab context menu commands from other Visual Studio add-ins. The IVsPackage parameter gives access to Visual Studio package interfaces like Microsoft.VisualStudio.Shell.Interop.IVsPackage, System.IServiceProvider etc. It is not null only in Visual Studio 2015+. Using Visual Studio and C#, start creating an add-in from the C# class library template project. References to EnvDTE and EnvDTE80 are needed to use the DTE2 parameter in the OnConnection method. PresentationCore, PresentationFramework and WindowsBase are needed to work with WPF controls. TabsStudioExt defines all Tabs Studio extensibility interfaces. Add-in information for Add-in Manager is extracted from the version resource in the add-in dll file. Add-in name is extracted from the ProductName key, in C# project it is set using the AssemblyProduct attribute. Description is extracted from the FileDescription key defined by the AssemblyTitle attribute. Version is extracted from the ProductVersion key defined by the AssemblyFileVersion attribute. To change tab title from an add-in use the TitleManager property in TabsStudioExt.Tab and TabsStudioExt.TabExtension classes. An add-in can modify the regex transforms list and call the ApplyTransforms method. An add-in can add, remove and modify menu items in the Tabs Studio context menu handling OpeningTabContextMenu and OpeningTabExtensionContextMenu events. Right click on a tab with a single extension generates the OpeningTabExtensionContextMenu event. To simplify customization from an add-in, each menu item and separator in the default context menu has distinct Name. For document tab context menu, the names are: Open, OpenSeparator, Save, SaveSeparator, Close, CloseAllButThis, CloseAllDocuments, FileSeparator, CopyFullPath, OpenContainingFolder, VS2010DocumentSeparator, VS2010Floating, FloatAll, VS2010Dockable, TabGroupsSeparator, MoveToNextTabGroup, MoveAllToNextTabGroup, MoveToPreviousTabGroup, MoveAllToPreviousTabGroup, TabsStudioSeparator, SetColor and TabsStudio. For non-document tab context menu, additional names are: WindowSeparator, Floating, FloatAll, Dockable, TabbedDocument, AutoHide and Hide. In your add-in project set the Build - Output path to your TabsStudioAddins directory (e.g. C:\Users\myadmin\Documents\Visual Studio 2008\Addins\TabsStudioAddins). 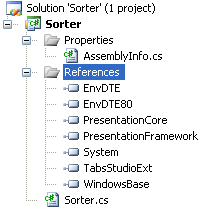 In your add-in project set Debug - Start external program to VS (e.g. C:\Program Files\Microsoft Visual Studio 9.0\Common7\IDE\devenv.exe). To debug an add-in in Visual Studio 2010 SP1 retarget it for .NET 4 or set .NET 4 startup project.